I made the move over to the publisher side and worked at CBS Interactive selling their Entertainment and Gaming properties. My boss at the time continues to be my business mentor to this day. And now, I currently work at DEFY Media as a brand storyteller, helping grow revenue across the Gaming, Automotive and Entertainment verticals. My experience working on both agency and publisher roles has helped me understand this industry so much and I’ve been tremendously lucky to have worked with so many great people! Honestly, my family keeps me motivated. Every day I get home from work and my kids (ages 4 and 2) don’t care if I closed a deal or crushed a PPT presentation. They care about the simple things, like how the flowers smell in our backyard or watching airplanes fly in the sky. Seeing the world thru their eyes really makes me want to be a better person in all avenues of my life. There’s so much change happening in the industry today so it’s exciting to see how much of it is continues to evolve. One year, MCN’s are the hottest thing to talk about, now it’s all about the power of influencers. It definitely keeps you on your toes as you need to constantly educate yourself in the marketplace to see who is really disrupting the industry. We already see it now but there’s such a big focus on the power of content. Major companies are consolidating so that they can create more premium content for consumers (i.e. Disney acquiring Fox). Companies like Netflix, Amazon, and Hulu are all doubling down to make sure they have the next Handmaid’s Tale or Stranger Things franchise. The concept of Skinny Bundles really shows you that content is king and that consumers will dictate what they want to watch, so I think in the next five years, companies who create authentic content with truly engaged audiences will succeed. Being a female Sales Executive in our industry must not always be an easy journey. What’s the most important lesson you’ve learned so far? Trying to take on too many things and spreading myself too thin. I learned quickly that you really have to focus on the important things that move the needle. Also, I think it’s important to make yourself a seat at the table since it’s not always given to you. But make sure you are worthy of that seat! What advice do you have for emerging professionals just starting in advertising? I can’t say this enough when I mentor folks who are just graduating from college: network, network, network. Most career opportunities will happen due to your own personal network, so make sure your networking game is strong. Also, I recently attended a Women’s Leadership conference, and they reminded me that working on your own personal brand is extremely important. The ThinkLA community is amazing. If you aren’t actively involved, I definitely urge you to do so, as you’ll meet so many friends and business mentors who will help you grow in your career. 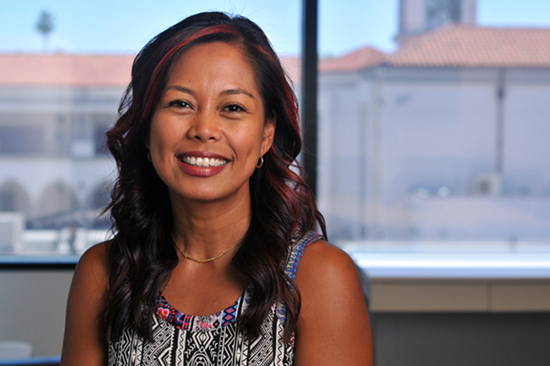 Myra Marayag is VP of Sales at DEFY Media and currently serves on the ThinkLA IDEA Council.